With the iPad 2 coming out this week, it seemed like the perfect time to check out the latest iPad accordion apps. Believe it or not, this is actually a pretty active category — we found more than 25 apps for the iPad alone, and even more for the iPhone and iPod Touch. Wait, that Hohner? Yes, the world’s largest accordion maker now has a line of iPad apps that mimic their Corona Classic diatonic accordions. You can show or hide the names of the notes on the keyboard, tap on the bellows to alternate between “push” and “pull” mode, and even switch between wet and dry tuning. The app is treble only — no bass/chord buttons (although this isn’t a big loss for most diatonic players I know). The app comes in five key combinations — GCF, FB&flat;E&flat;, EAD, ADG, and B&flat;E&flat;A&flat; — and there’s also a “mini” version for iPhone/iPod touch. Michael Eskin, who developed the app for Hohner, has a number of other accordion-related apps available, including one-row Cajun/Zydeco accordion, two-row Melodeon, and Anglo Concertina. We reviewed the first version of Accordéon last year when it was one of the only accordion apps available. It offers a piano accordion interface and even includes a handful of bass/chord buttons so you can get a fairly full sound going. My favorite feature, though, is the “Learning Center,” which helps you learn popular songs by following along with highlighted keys. “Jingle Bells” comes for free with the app and you can buy other tunes for 99 cents each. The chromatic accordion has always intimidated me with its vast, imposing array of buttons. Accordio Pro has helped conquer that fear by simulating a full-featured chromatic accordion, complete with six-row Stradella bass. You can switch between C, G, and B-layouts, scroll and zoom along the keyboard, and even play along to songs in your music library. 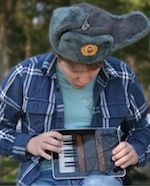 The developer also makes a version for piano accordion. 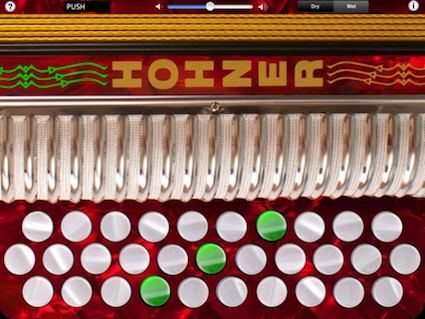 Have you played “pocket squeezebox” on your iPad or iPhone and have an app to recommend? Leave a comment and let us know!